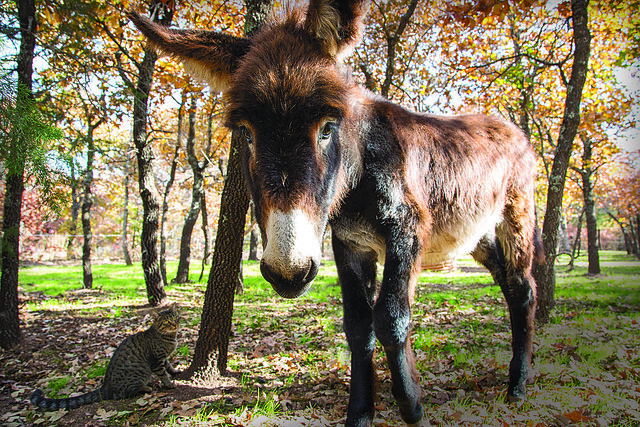 A small Oklahoma donkey dairy is milking health benefits from an unexpected source. Three years ago, Saundra and Walt Traywick’s daughter was dealing with a common childhood illness. But suddenly, what seemed to be a typical case of strep throat turned into something much worse. The little girl had developed Pediatric Autoimmune Neuropsychiatric Disorders Associated with Streptococcal Infections, or PANDAS, a disease that causes the immune system to attack the brain. The ailment presents symptoms like irritability, obsessive-compulsive disorder, and anxiety. The six-year-old had become terrified of saying something that was not 100 percent true, even if it was unintentional. Something had to be done, but treatments for PANDAS are limited. “The doctors’ best guess was that she would have to be on antibiotics every day for many years or take IVIG treatments, which required hospitalization and were very expensive,” Saundra says. Not satisfied with those answers, the Traywicks started researching alternatives. Soon, Saundra heard about donkey milk through a naturopath. They decided to give it a try. The Traywicks had found a potential solution to their daughter’s problem, but they faced challenges getting milk. So, at the end of 2014, the Traywicks bought some land east of Oklahoma City and three American Mammoth donkeys. Though the Traywicks closely watch everything they put into their bodies, they largely attribute their daughter’s recovery to the healing power of donkey milk. Spreading the word about the health benefits of donkey milk is a big part of Saundra’s mission—as is helping other parents who face the same challenges she did. “Saundra posted on a Facebook group about PANDAS that she would give a jar of milk free to any parent of a child with PANDAS, so we planned a trip to Oklahoma,” says Tami, a Dallas resident. Within five hours, Tami says she had seen an impact in her daughter’s obsessive-compulsive behavior, and within seven days, there were even more remarkable results, prompting multiple trips back to Oklahoma. The health benefits of donkey milk aren’t limited to the internal. In early 2015, Saundra started her Dulce de Donké skincare line. Her natural soaps, moisturizer, deodorants, and hair care—all of which have earned rave reviews— are made with donkey milk, essential oils, and other gentle ingredients. But for the Traywicks, children’s health always comes first. “If there’s a sick child who needs some donkey milk, we’ll sell it to their families before we make more skincare,” Saundra says. Since the Traywicks’ donkeys produce only between one and six cups of milk per day, there’s a lot of work that goes into—and not much money that comes from—a donkey dairy. But the Traywicks and families like them are thankful for every last drop. For information about buying donkey milk and Dulce de Donké products, visit dulcededonke.com.